In Italy, Mario Monti has been asked to form a new government to tackle an acute debt crisis which prompted the resignation of Silvio Berlusconi. Italy's borrowing costs have spiked, threatening the Euro zone. Hailing Mr. Monti's appointment, E.U leaders vowed to monitor Italy's austerity measures. He said, "We will aim at solving the financial situation, resume the path of growth. We want to build a future of dignity and hope for our children". Mr. Monti is hinting that he wants to restore Italy's reputation financially to match the size of its economy rather than the down talk about the credibility it has had over recent months. Israel is demanding tougher international action on Iran's nuclear programme following new revelations by the U.N. nuclear watchdog. The Israeli Prime Minister Benjamin Netanyahu says a report by the International Atomic Energy Agency proves what Israel has been saying all along. He told the Cabinet that the report shows that Iran is systematically developing nuclear weapons. He called for the international community to stop Iran's race for nuclear weapons, which he said endangers the peace of the entire world. Iran says, its nuclear programme is for peaceful purposes and it described the IAEA report as politically motivated.But Israel sees Iran’s nuclear programme as an existential threat and it has been alarmed by statements by Iranian President Mahmoud Ahmadinejad who has threatened to wipe the Jewish state off the map. World Diabetes Day is started by the International Diabetes Federation (IDF) and WHO, the Day is celebrated on 14 November to mark the birthday of Frederick Banting who, along with Charles Best, was instrumental in the discovery of insulin in 1922, a life-saving treatment for diabetes patients. WHO estimates that more than 346 million people worldwide have diabetes. In India, diabetes affects one in five adults. If not well controlled, diabetes can lead to heart attack, stroke or kidney failure. The United States, the United Kingdom and Canada have announced new sanctions against Iran amid growing concern over its nuclear programme. The U.K said earlier it was cutting all ties with Iranian banks while Canada said it was banning exports for the petrochemical, oil and gas industries. Tehran insists its nuclear programme is solely for civilian purposes. The report by the UN's nuclear watchdog, IAEA, said Iran had carried out tests relevant to the development of a nuclear device. Meanwhile Iran responded Western sanctions aim at "propagandistic, psychological war"
In Egypt, the military rulers, the Supreme Council of Armed Forces (SCAF) has accepted the resignation of the civilian Government led by the Prime Minister Essam Sharaf. The entire cabinet resigned amidst mounting violent protests across the country. The Coalition of Revolution Youth and the April 6 movement have demanded the formation of a national salvation government , holding preesidential elections by April 2012 and a complete overhaul of the interior ministry. Protesters say they won’t vacate Tahrir Square till the military handover power to a civilian Government. Political forces behind the uprising and pro-democracy demonstrators have called for a million-strong protest in the Egyptian capital's Tahrir Square on the fourth day of unrest against the interim military regime. The army says it will hand over power after the presidential elections which may be held in early 2013. It is an Egyptian Facebook group started in 2008 to support the workers in El-Mahalla El-Kubra, an industrial town, who were planning to strike on April 6. Through different social media's like Facebook, Twitter, Flickr and blogs, the activists drew attention to their efforts. It has over 100,000 predominantly young and educated members, most of whom had not been politically active before; their core concerns include free speech, nepotism in government and the country's stagnant economy. Their discussion forum on Facebook features intense and heated discussions, and is constantly updated with new postings. The Supreme Council of the Armed Forces consists of a body of 20 senior officers in the Egyptian military. As a consequence of the Egyptian Revolution of 2011, the Council was handed the power to govern Egypt by its departing President Hosni Mubarak on February 11, 2011. The military junta, headed by Mohamed Hussein Tantawi, announced in February 2011 that the constitution would be suspended, both houses of parliament dissolved, and that the military would rule for six months until elections could be held.But the rule is till in force. 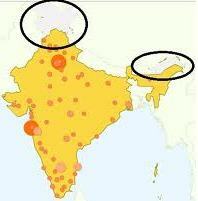 India Map Controversy is an ongoing issues related with the map of India. Maps issued by United States, China and Google have shown some of north-eastern part of India as part of China and Jammu and Kashmir as a part of Pakistan-administered Kashmir. A new controversy erupted last week after Chinese Ambassador to India Zhang Yan lost his temper when he was asked by an Indian journalist on a map of a Chinese company's brochure that showed Ladakh and Arunachal Pradesh as part of China. Yan told the Indian journalist to 'shut up' when he was asked to comment on the matter. India and China have been engaged in border related dispute for quite some time now with China claiming Arunachal Pradesh to be part of their land. The issue is a part of the boundary-related talks between the two neighboring nations.